The Truckee boys' tennis team poses with the Class 3A Northern League trophy on Monday, Oct. 8. Before the fall sports season began, the captains of the Truckee boys’ tennis team sat down for a meeting with Head Coach Lucy Schram. Seniors Zach Hass and Zach Larson already possessed individual state titles as reigning singles and doubles champions, respectively, but the two players stated they were hungry for more in their final year, and had set their sights on bringing the boys’ program its first-ever team state championship. 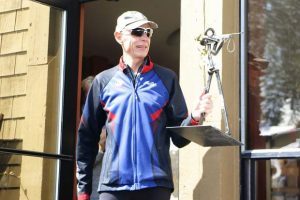 “These captains, Haas and Larson, that has been their goal from day one this year, and that is that this team is deep and strong and ready to challenge for state,” said Schram. 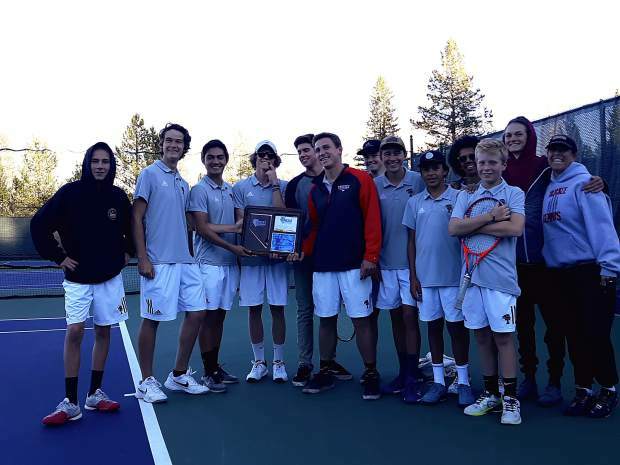 The Wolverines took another step toward a state championship on Monday, Oct. 8, dominating South Tahoe in the Class 3A Northern League championship game at the Tahoe Donner Tennis Center for Truckee’s first regional title since 2015. The Wolverines wrapped up the league championship after two rounds of play, having built a 10-2 lead over the Vikings. 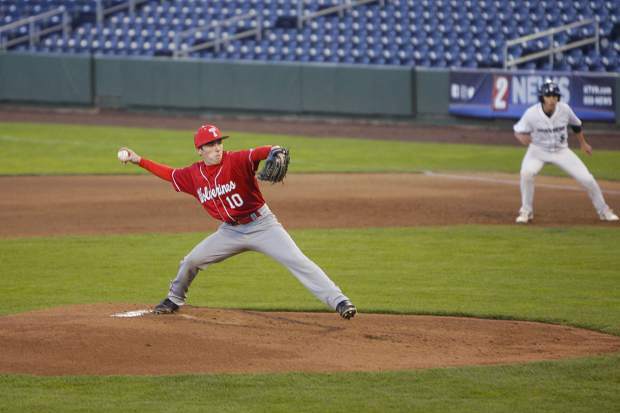 The Vikings had defeated the Wolverines, 10-8, in the finals of the regional tournament in each of the past two season, including an upset last year after Truckee had gone undefeated through regular season play. This year, Truckee against went 10-0 during the regular season, stretching the program’s winning streak outside of the postseason to 24 wins, which dates back to 2016. Larson, who won a doubles state championship with senior Noah Warren, teamed up with senior Sawyer Laine to win three matches against South Tahoe on Monday. “This year, all three of us (Haas, Warren, and Larson) have taken more of a leadership position on the team,” said Larson on this year’s team. Due to Warren being out with an injury (shoulder), Laine filled in with Larson during the tournament, and has excelled in doubles play this year, going 17-2 during the regular season, and 5-0 in the post season, thus far. Warren and Larson are expected to play together later in the week in the Northern League doubles tournament. The defending champions are the No. 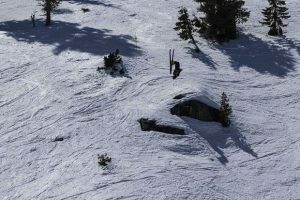 1 seed and open play against North Tahoe’s No. 16 seeded squad, junior Julian Cayolle and sophomore John Lyons. The tournament begins at 10:30 a.m. on Friday, Oct. 12, at the Tahoe Donner Tennis Center. In singles play, two-time state champion and three-time Northern League champion, Haas, breezed through two South Tahoe opponents during Monday’s finals. “It feels good for my senior year to go out with a bang. (We) definitely played strong to win before the match was even over,” said Haas, who hasn’t lost a high school match since the state championship singles final his freshman year. If Haas is able to collect a third consecutive state title in singles, he’ll become just the fourth player in the history of the Nevada Interscholastic Activities Association, and first athlete since 1994, to do so. No boy athlete has won four state championships in singles. Sorter, who is 25-1 thus far in singles play, won all three of his matches on Monday, including coming back from down 3-0 to win 6-3 against the No. 5 player in the Northern League, South Tahoe junior Juan Vazquez. Sorter will enter this Friday’s regional singles tournament as the No. 2 seed. Junior Lucas Kraatz also qualified for the tournament as the No. 8 seed. North Tahoe will have senior Murphy Scott, who will have the tall order of facing Haas in the opening round. The Lakers also have No. 12 seed, senior Dillon Hudson. The Class 3A Northern League singles tournament will also be played at the Tahoe Donner Tennis Center, and is scheduled to get underway at 10:30 a.m. on Friday.